“I didn’t even know there was a creek here and I come here all the time!” exclaimed Anastasia, a fifth grade student from Ford Elementary School in Richmond. 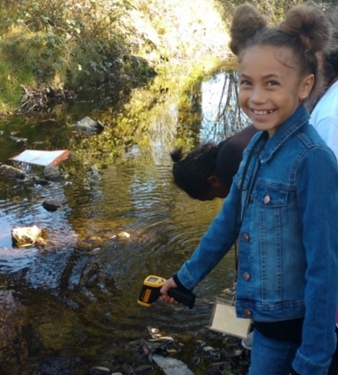 Anastasia and her class visited Wildcat Creek in Davis Park to study creek-side plants, test the water quality and complete a creek-side trash clean-up project as part of their Watershed Action Program with KIDS for the BAY. “I liked cleaning up our park today! I am going to continue to take action and tell people not to litter. Hopefully together we can make a better change in the world,” shared Valeria, another student in the class. According to a survey done in the U.S. by the Nature Conservancy, 61 percent of children surveyed stated that they did not have natural areas near their homes. Throughout Contra Costa and Alameda Counties, KIDS for the BAY elementary school students are gaining a new perspective on their ability to explore and improve their local environment through Environmental Action Projects. The Watershed Action Program strives to create a connection between students and nature in their local watershed and give them the knowledge to return to local natural areas with their families. Partner teachers are also learning how to use the local environment to teach Next Generation Science Standards and help develop the next generation of Inspired Environmentalists. Action starts with connection! Learn more about KIDS for the BAY School Programs here.